November 8th is a special day for me because it was the day my first child was born. I’ll never forget that day, and neither will Mary Herrera. But, for obviously different reasons. 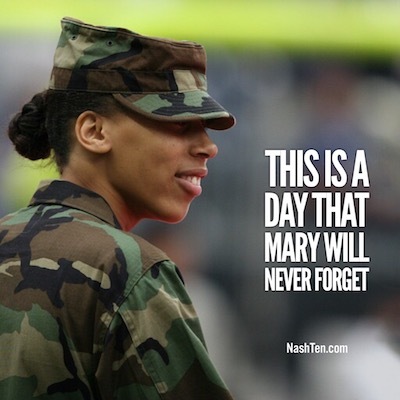 On November 8, 2003, Mary was the lead gunner on a Humvee in Iraq escorting prisoners to a holding facility in Fallujah when she noticed two spotters on top of the next bridge. She immediately knew what this meant and dropped back into the vehicle to warn her fellow soldiers. Before she could stand back in her turret, they were already being hit. Mary started returning fire when she felt something in her right arm. She initially thought she had been hit by a rock and kept firing. Then she was hit again and her right arm fell limp. She continued to return fire until they made it safely through the ambush. Due to the look on her commanders face, she knew the injury was bad. She was airlifted to a hospital in Fallujah where doctors told her that she would lose her arm. Later she was sent for surgeries in Germany and Brooke Army Medical Center in Texas. It took 20 operations over the course of a year to save her mangled arm. Though she still suffers from chronic pain. Her story inspired the state of Arizona to pass a bill in her name that waived student loans for those soldiers who received a Purple Heart or where medically discharged due to injuries suffered in the military. Mary and her story were instrumental in raising money to fund the first Fisher House in Arizona. Fisher House is a non-profit that provides comfortable housing at no cost to families that are visiting soldiers receiving treatment at VA hospitals across the United States. Tomorrow is Veterans Day. A day to honor all veterans who have served in America’s armed forces. Today, I’d like to raise a toast to Mary Herrera and all who have served the great citizens of the United States of America. We are all indebted to their bravery, commitment, and sacrifice. The Daily Deal in Nashville is a beautiful 4 bedroom Bungalow in Eastwood Neighbors [East Nashville]. The home has been renovated to an open living concept and is listed for less than $400,000.